All eyes were on Frankel as he landed the 14th, and last, victory of his unbeaten career taking the Qipco Champion Stakes at Ascot. The Galileo colt, trained by Sir Henry Cecil, won his 9th Group One race with a trademark display of pure brilliance - despite being slowly away from the stalls. 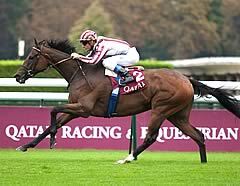 Sent off the 2-11 favourite, Khalid Abdullah's wonder colt took up the running from Cirrus Des Aigles over a furlong out under his ever-present jockey Tom Queally and pulled away from the French raider to win cosily by a length and three-quarters. 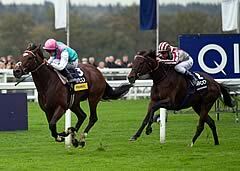 Cecil said: "He didn't like the ground much, but he was very relaxed. He's the best I've ever had. He's the best I've ever seen. I'd be surprised if there's ever been any better." Owner Prince Khalid Abdulla confirmed that Frankel had run his last race after the greatest horse of modern times made it 14 wins from as many starts. “This was a career-defining performance. He was slowly away but the great thing is that he is so relaxed and he got into a rhythm again. He’s unhustled and relaxed and he had a trouble-free run into the straight. I was confident that he’d put the race to bed and that’s what he did. 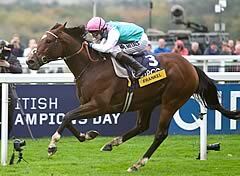 Queally said: “I’m really proud of Frankel and we have been on an amazing journey. He was slowly away at York and he was a little bit slower today but I have so much belief in the horse and I suppose that we have pushed that to the limit in the past but he is amazing. We lost a length at the start but a length is nothing to him. “It’s fair to say that he is better on better ground but the 4x4 kicked in and he is everything that you could imagine in a horse. He didn't really enjoy the ground - he didn't bounce of it like he can do - but that shows you what sort of horse we are dealing with. Under the circumstances I would say it’s up there with his best performances. Statistics provided by TurfTRax show Frankel’s top speed in the QIPCO Champion Stakes was 37.5mph and the fastest single furlong he ran was from the 3f to 2f marker - he covered that distance in 12 seconds dead.